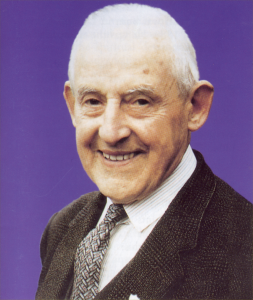 Frank Duff was born in Dublin, Ireland, on June 7th 1889, the eldest of seven children. In 1913, he joined the Society of St. Vincent de Paul and was greatly influenced by the spirit of the Society. As a member, he gradually came to have a great love for the poor and underprivileged in whom, as in everybody he met, he recognized and honored Christ. In 1916, aged 27, he published his first pamphlet "Can we be Saints?" In it he expressed one of the strongest convictions of his life, namely, that all without exception area called to be saints and that through our Catholic faith we have available all the means necessary to attain this. In 1917 he came to know the Treatise of St. Louis Marie de Montfort on the True Devotion to Mary, a work which changed his life completely. On September 7th, 1921 Frank Duff founded the Legion of Mary. This is a lay apostolic organization at the service of the Church, under ecclesiastical guidance. Its twofold purpose is the spiritual development of its members and advancing the reign of Christ trough Our Lady. The Legion, which is to be found in almost every country in the world, has nearly 3 million active members and many more auxiliary (praying) members. In July 1996 the cause of his canonization was introduced by the Archbishop of Dublin, Dr. Desmond Connell. God our Father, You inspired your servant Frank Duff with a profound insight into the mystery of your Church, the Body of Christ, and of the place of Mary the Mother of Jesus in this mystery. In his immense desire to share this insight with others and in filial dependence on Mary he formed her Legion to be a sign of her maternal love for the world and a means of enlisting all her children in the Church's evangelizing work. We thank you, Father, for the graces conferred on him and for the benefits accruing to the Church from his courageous and shining faith. We ask too that if it be in accordance with your will, the holiness of his life may be acknowledged by the Church for the glory of Your Name, through Christ Our Lord. Amen. Eternal Father, I thank You for the grace you gave to your servant, Edel Quinn, of striving to live always in the joy of Your presence, for the radiant charity infused into her heart by Your Holy Spirit, and for the strength she drew from the Bread of Life to labor until death for the glory of Your Name, in loving dependence on Mary, Mother of the Church. Confident, O Merciful Father, that her life was pleasing to You, I beg You to grant me, through her intercession, the special favor I now implore …, and to make known by miracles the glory she enjoys in Heaven, so that she may be glorified also by Your Church on earth, through Christ Our Lord. Amen. We place our petitions in the hands of Mary to whom Edel turned in every need. Hail Mary, full of grace, the Lord is with thee. Blessed art thou among women, and blessed is the Fruit of thy womb. Jesus. Holy Mary, Mother of God, pray for us sinners, now, and at the hour of our death. Amen. 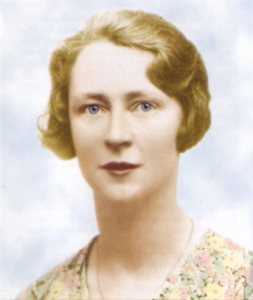 Edel Quinn was born in Kanturk, Co. Cork, Ireland on September 14th, 1907. As a girl her ambition was to enter a Contemplative Convent, but she was prevented from doing so by ill health. At the age of 20 she joined the Legion of Mary in Dublin and gave herself entirely to its apostolate. in 1932 she became seriously ill and spent a long period in hospital. She later resumed her Legion work, though with her health permanently impaired. In 1936, Edel was appointed Legion of Mary Envoy with the commission to establish the organization in the vast territories of East and Central Africa. She encountered great obstacles in this pioneering work. As against every difficulty and her wretched health, she brought to her task an absolute faith in God's love and a limitless trust in the maternal care of the Blessed Virgin. Edel was gifted with a clear practical mind, notable organizing ability, an indomitable will, a deep fund of warm, human sympathy and an infectious joyousness of spirit that never failed her. These qualities eventually won everyone to her side. Although working alone and in a state of perpetual ill-health and exhaustion, Edel established the Legion on a firm, enduring basis even as far a Mauritius in the Indian Ocean. Hundreds of Legion branches and multiple councils were established and she mobilized thousands of Africans in the service of the Church. After eight years of heroic labor, Edel died in Nairobi on May 14th, 1944, where she is buried in the Missionaries' Cemetery. The Diocesan Process, the first step towards her beatification, was sent in motion by the Archbishop of Nairobi. On 15th December 1994 our Holy Father, Pope John Paul II in a special assembly of the Cardinals and other members of the Congregation for the Causes of the Saints made the following solemn declaration.. "It is certain that the Servant of God, Edel Mary Quinn, a secular virgin of the Legion of Mary, practiced to a heroic degree the theological virtues of Faith, Hope and Charity towards God and her neighbor and likewise the cardinal virtues of Prudence, Justice, Temperance and Fortitude." He ordered the Decree to be published and to be inserted in the Acts of the Congregation. Because of this proclamation of her outstanding holiness Edel Quinn now bears the title Venerable. O God, who by Your infinite mercy inflamed the heart of your servant, Alphonsus Lambe with an ardent love for you and for Mary, our Mother; a love which revealed itself in a life of intense labor, prayer and sacrifice for the salvation of souls, grant, if it be your will, that we may obtain, by his intercession, what we cannot obtain by our own merits. We ask this through Jesus Christ, Our Lord. Amen. The servant of God, Alphonsus Lambe, (known as Alfie) was born in Tullamore, Ireland on the feast of St. John the Baptist, Friday, 24th June 1932, during the International Eucharistic Congress in Dublin. Like St. John he was a precursor - the precursor of the Legion of Mary, which Pope Paul VI described as "the greatest movement which has been established for the good of souls since the era of the great religious orders". After spending a period of his youth in the novitiate of the Irish Christian Brothers, which he had to leave because of delicate health, he found his vocation in the Legion of Mary, and was appointed Envoy in 1953. With Seamus Grace, he left for Bogotá, Colombia on the feast of Our Lady of Mount Carmel (16th July) of that year. For almost six years he worked ceaselessly in promoting the Legion of Mary in Colombia, Argentina, Ecuador, Uruguay and Brazil. 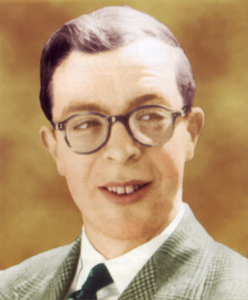 After a short but grave illness he died in Buenos Aires on the feast of St. Agnes, 21st January 1959. God had bestowed on him great natural gifts, a personality which attracted souls to the service and love of God, an infectious enthusiasm and a facility for learning languages, which enabled him to rapidly attain fluency in Spanish and Portuguese. During his years in South America he set up a great number of branches of the Legion of Mary and trained a multitude in the apostolate of the Legion. His devotion to Mary was outstanding, and in contacts with Legionaries and others he explained and urged the practice of the True Devotion to Our Lady. He is buried in the vault of the Irish Christian Brothers, in the Recoleta Cemetery, Buenos Aires.